Another two of my Frocktober fundraising challenge outfits. A nice casual shift dress for working from home and a fancier lace LBD for the office to tie in with our team fundraising theme for the week. I wore this the same day I took the video of my Shopbop sale purchases. I was so excited to wear the scarf right away! It does look a bit big though....hoping I can figure out how to tie it better and get some more wear out of it (it's only linen) before the weather heats up too much here in Brisbane. I'd bought it without checking the measurements as it reminded me of a scarf I had my eye on in the July sales, when I was doing #noBuyJuly. That scarf sold out before July was over and I could shop again. I'd been looking for a yellow scarf since, so was excited to pick this one up! I worked from home and had an OB appointment in the morning, so I had to put some shorts under the dress so I had a little bit of modesty intact when the OB was checking baby's progress. Last worn: Zara navy shift dress, denim shorts, Ikwetta sandals, Balenciaga day bag. First time I've worn the scarf as it is a recent purchase. Other ways to wear: Zara navy printed dress layered up for winter, denim shorts with a striped dress, Ikwetta sandals and a maxi dress, Balenciaga day bag with shorts. Although I'm only in the office 2 days a week, I've managed to get quite a few of my colleagues excited about Frocktober. We've been trying to get group pics as we go along, as we email them around to the department with updates on our dress wearing and fundraising progress. This day, someone suggested we should all try wear our best LBDs, and the final picture was awesome. Wish we had come up with a weekly theme sooner! Maybe next year. I'd worn this dress in the third trimester before so I was confident I'd still be able to fit into it, and so I'd been keeping it in reserve for the later days of the end of the challenge when I suspected I'd be running out of dresses that fit! Was grateful to have something I knew I would be able to wear. Last worn: black lace dress, black ballet flats, Mulberry foggy grey Alexa bag. Other ways to wear: black lace dress for a work party, black flats and skinny jeans, Mulberry Alexa with jeans and a tee. Linking up with Let It Shine, Shoe and Tell, Hello Monday, Classy Monday, Mix It Monday, Turning Heads, On Trend Tuesday, Style Sessions, Confident Twosday, Wardrobe Wednesday, Wednesday Blog Hop, Whatcha Wearing Wednesday, Pleated Poppy. You look great in both looks! I love how you paired the yellow scarf, it's such an eyecatcher! You make me want to do Frocktober next year, it sounds fun. I love the yellow scarf. It's one of my favourite colours right now. I'm sure you can find a way to deal with the issue of it being too big. The second dress is really beautiful with the lace. I've never really thought of jeans west doing dresses before. It's been way too long since I went there. Jeanswest have some really nice things, I spend way too much money in that store, haha! I hope you can do Frocktober next year - it's a wonderful way to raise money! So cool that your colleagues followed you in this fun Dress challenge. I love the first look. Both dresses today are so cute. You are inspiring me to dress down a lace LBD like you did. Oh and I loooooove yellow on you, Mica. You look so beautiful in this lace dress. Love this yellow scarf. Cute dresses! And I love the yellow scarf! Yay! You got to wear the yellow scarf! It's so pretty, and I LOVE you in the lace dress too! I love how the color of your bag goes with the second dress, such an elegant look! love these casual dresses! so pretty!! I love both your dresses, but especially the first one with the fun pattern! That lace dress is so elegant on you! Pregnant or not pregnant it's beautiful! haha yes I think with a mobile toddler I need to invest in some of those kind of shorts too! That Mulberry Alexa is wonderful, I really don't use it enough but every time I get it out I realise I can never part with it, ha! Love that lace dress on you! Such pretty deals. How fun to have what sounds like such a nice work environment. Love both dresses but I especially love the first one! I have a soft spot for pretty prints and the long-sleeves is perfect! Definitely something I would wear to work! The dress challenge sounds like a fun way to spice up the office! The printed shift dress is too cute and fits your bump perfectly. I'm in love with this Mulberry!! You have been blowing me away by how many cute dresses you have! I love the yellow scarf you added in the first outfit! haha this challenge has definitely shown me I have too many dresses! I love that first dress! the pattern is beautiful and the yellow scarf is a great touch. Love the pop of yellow and that now visible bump! Adorable combination with the scarf, Mica! Casual yet chic. I'm loving the 20s vibe of your lace dress, reminds me of The Great Gatsby. You're an adorable mommy to be, Mica! Your LBD hugs and shows off your figure beautifully. I need to learn how to tie scarves too. Gorgeous colour! These dresses look so pretty on you! Love the style and print of the Zara tunic dress! It looks perfect with the yellow scarf! Have a great week! So casual and cute, I am loving your looks. Love the blue and yellow...such cute color combo! I love that bright yellow scarf! It's so sunny and happy! I also love the lace dress, so pretty! I love your yellow scarf, it doesn't look big to me. I like both outfits, the second one is more dressed up, but they are both very feminine and quite fabulous! I love your designer bags collection! Such pretty dresses! Love the yellow scarf with the first one. Loving the Mulberry bag, it's just stunning. You look lovely, I'm enjoying this recap of all your dresses! Love a good day dress- super cute, lady! Two of my favorite types of dresses! Shift and your beautiufl lace dress, both look great on you, espcially with the grey B bag. I notice your little cutie pie getting in on the action too! Mica, that yellow scarf is so pretty with your dress! It's long, but so beautiful. Definitely paired well with your outfit. Great second dress also! You are glowing mama! I love these dresses on you :) You look absolutely beautiful! Love this Frocktober challenge! Can't wait to see what other dresses you wear! That casual blue dress is a winner - love that combo of blue and yellow on you! I love how bright the yellow scarf is! cute looks! I love that yellow scarf! You look gorgeous i the black lace dress! I love it! its such a joy to witness your journey! you're looking good and your outfits are just FAB! Those sandals in the first picture are so cute!!! I need a pair in my life. I'm in love with your second outfit! 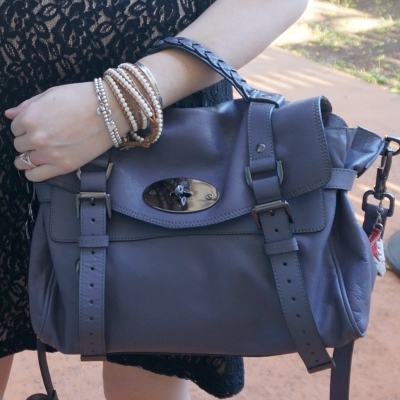 The lace LBD looks amazing on you, and the Mulberry bag in grey is so gorgeous!! That yellow scarf adds such a lovely touch! Love the pop of the yellow scarf in that first shot! The yellow scarf looks gorgeous against the print of the dress.